Not that the sermon wasn’t good or the Sunday school class wasn’t stimulating, but this is the best thing I learned in church today (yesterday as you read this). Pastor Randy returned from being away for several weeks in California and led the congregation in an impassioned prayer for Israel in these trying times. Randy lived in Israel for fifteen years and still has many Jewish friends there. One of his friends calls Randy every three days or so and gives him an update on what is really happening there, events you’ll never see reported on CNN or MSNBC. The Iron Dome missile defense is working but when a missile was intercepted directly over the home of Randy’s friend, they heard the loud explosion followed by the rain of shrapnel hitting the roof. The missile alarms go off daily prompting everyone to go to the shelters. The friend’s adult age daughter’s boyfriend is an officer of an elite ground unit in the IDF. This officer was leading his men (in the IDF officers don’t tell soldiers to go and do something while sitting back, they always say “follow me” and then lead their troops) through one of the thirty-eight known Hamas terrorist tunnels in Gaza when a booby trap bomb blew up literally in his face. The three men behind him died but amazingly, this man survived. A number of bones on his face were broken, bomb fragments are in both eyes, and he’s lost the hearing in one ear. He will regain his sight eventually but will always be partially deaf. Not only did Randy speak of blessings but of curses, and he even invoked these curses against all of Israel’s enemies. Which strongly implies the opposite to those who hate Jerusalem. From my point of view, loving Israel and cherishing Jerusalem is a “no brainer,” but after all, my wife of over thirty years is a Jew and I have learned a deep-seated compassion for the nation and the people whom God has called His “priests” and the “apple of His eye”. I also consider it spiritual suicide to not love Israel for in the end, God Himself will defend her against all of her enemies in war, which sadly I fear, includes the nation in which I live. This topic wasn’t supposed to spill over into Sunday school class but when Charlie was asking for prayer requests, I mentioned that Randy fulfilled my typical request in a much better way than I ever could. That started a discussion and one fellow, who tends to have a “sparky” temper at times, inserted the “there are two sides to every story” argument. I didn’t mind, and in fact I agreed with him, when he said that the Arab non-combatants in Gaza are as much victims of Hamas as the Jewish Israelis, but he then downgraded Israel and her current Jewish population saying they are guilty of doing many wrongs as well. I can’t speak for the actions of every individual in Israel, but I can see that God didn’t promise to fight off the enemies of the “Palestine,” He will defeat the enemies of Israel. To stand against Israel now, even in the slightest degree, isn’t only standing on the wrong side of history, it’s standing on the wrong side of God. I wasn’t the only one to come to Israel’s defense in class, and shortly afterward, this fellow seeing “both sides” got up and left, followed a minute or so later by his wife. I actually feel bad about that because on many other levels, this person does love Jesus and sincerely serves him (he just returned with a group from our church who went on a short-term missions trip to the Philippines and Thailand). It’s just that so many Christians are blind as to the true focus of Christ’s love and what Jerusalem means to him. I mentioned before that I thought John MacArthur’s current battle against the Presbyterian Church (U.S.A.) over PCUSA’s support of “marriage equality” was something of a Red Herring, not because MacArthur isn’t sincere (he’s always sincere), but because the center of God’s attention is always Israel. This isn’t to say that missions trips or the many other fine endeavors of the Church are “Red Herrings,” but we can’t let all of these other activities make us take our eye off the ball, so to speak, lest we lose the prosperity that comes of loving Jerusalem and praying for her Shalom. The rest of the world, and particularly Europe, are attacking the Jews over perceived Israeli injustices in Gaza. Sometimes those attacks include physical assaults against Jewish people. How long before European nations start marshalling their armies and physically attack the nation of the Jews: Israel? Here in America, we have lost our way as well and can no longer see the moral chasm between Israel and Hamas (that last link leads to an article written by General James T. Conway, who retired in 2010, and was the 34th commandant of the U.S. Marine Corps). Most of us, including many in the Church, swallow the anti-Israel, anti-Jewish propaganda being pumped at us by the mainstream news media as well as social media venues. We pay attention to secular “wisdom” and abandon the Word of God. More’s the pity. Randy said that in the days of the Temple, many of the songs of ascents would be sung by those who were going up to Jerusalem, to the House of the God of Jacob, He asked us to imagine going up the steps with Psalm 122 on our lips. Imagine the Levitical priests singing the songs as you entered the Temple court. Imagine the anticipation, the grandeur, the beauty, the thrill of approaching a tangible encounter with God in the only place in the world He has placed His Name. I reminded my Sunday school class that in modern Judaism, you can pray the Psalms for different occasions. This is a good occasion to pray Psalm 122 for the peace of Israel. 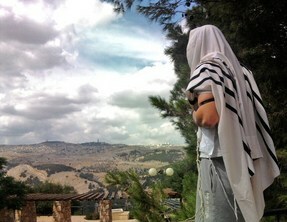 Pray for the peace of Jerusalem; those who love you will be serene. May there be peace within your wall, serenity within your palaces. For the sake of my brethren and my comrades, I shall speak of peace in your midst. For the sake of the House of Hashem, our God, I will request good for you. One last cautionary note. Verse five of Psalm 122 says, “For there sat thrones of judgment.” There will be a judgment against those who do not seek Israel’s peace. Choose a blessing and not a curse. Choose life. I don’t suppose you were able to obtain any clarification about the concerns felt by the “two sides” fellow (and, perhaps, his wife), or of what wrongs does he internally accuse Israel, or what merit does he perceive in the supposed other side of the story? Many folks presume erroneously about what is or is not being done by Israelis. Some folks mistakenly presume that both sides of a given story must be given equal credibility or validity. They fail to realize that one side may be lying or disingenuous or self-deluded, all of which may be said about Hamas. They find it difficult to believe when they encounter an almost black-and-white conflict, because such clarity is rare. I’m curious and have been meaning to ask you this, do you go to Sunday school or church for that matter because of the Tent of David book by FFOZ? OBTW — that opinion piece in the Wall Street Journal by James T. Conway, which you linked above, can be read only by subscribers. Po’ folk like me can barely see the first paragraph. The 3-mile-long tunnel from Gaza was designed for launching murder and kidnapping raids. Americans are understandably concerned when they hear that the majority of Palestinian casualties in the fighting between Israel and Hamas have been civilians and when they see images of houses in Gaza reduced to rubble and women wailing. Given the lack of corresponding Israeli civilian casualties to date, this creates the impression of an unequal—and hence immoral—fight between Israel and Hamas. Although American empathy for noncombatants is a critical component of who we are as a people, it should not blind us to reality: Israel’s military exists to protect its civilian population and seeks to avoid harming noncombatants, while its adversary cynically uses Palestinian civilians as human shields while deliberately targeting Israeli civilians. Israel, fearing just such tunnel-building, has long tried to limit imports of concrete to Gaza for anything but humanitarian projects, yet somehow thousands of tons of the material have been diverted for terror use rather than building hospitals or housing for Palestinians. Since the beginning of ground operations into Gaza, the IDF has uncovered approximately 30 similar tunnels leading into Israel, in addition to the more than two dozen discovered prior to Operation Protective Edge. Hamas operatives have been intercepted emerging from such tunnels in Israel carrying tranquilizers and handcuffs, apparently hoping to replicate the successful 2006 kidnapping of IDF soldier Gilad Shalit, for whom Israel exchanged 1,000 Palestinian prisoners in 2011. Beyond targeting Israeli civilians with kidnappings and with the indiscriminate firing of rockets, Hamas shows a callous disregard for the lives of the Palestinians it ostensibly represents. Earlier this month Hamas spokesman Sami Abu Zuhri appeared on Al-Aqsa TV and encouraged Gaza residents to act as human shields. They appear to have heeded the call: Israeli Defense Forces combat video has shown Palestinians rushing to rooftops after receiving warnings from Israel—via phone calls, text messages, and unarmed “knock-knock” small projectiles striking a targeted building—that a missile attack is imminent. Nor is Hamas the only potential adversary of Israel that believes its civilians’ propaganda value is worth more than their lives. From an IDF outpost overlooking the border, I saw housing tracts in Lebanon built with Iranian money after Israel’s 2006 war with Hezbollah. The IDF has determined that the housing masks the launch sites for some of the more than 100,000 rockets that Hezbollah holds in reserve for attacking Israel and its citizens. As we have seen in images from Gaza, the occupants of these dwellings either will serve as human shields to deter Israeli pre-emptive strikes, or in the event of another war they will be valuable “collateral damage”—dying in the service of Hezbollah’s propaganda mill. This cynical inducement of civilian suffering for propaganda is in marked contrast to the IDF’s treatment of noncombatants. While Hamas is encouraging the sacrifice of its civilian population—and its cowardly leadership is ensconced in underground bomb shelters—the IDF reports that in the conflict’s first week it provided more than 4,400 tons of food to Palestinians in Gaza, about 900 tons of natural gas and about 3.2 million liters of diesel fuel. All this despite 1,700 Hamas rockets fired at Israel. Meanwhile, the Rutenberg power plant outside Ashdod in Israel supplies Gaza with electricity, though the Palestinian Authority’s payments are badly in arrears. This supply only stopped when a Hamas rocket destroyed the power lines to Gaza on July 13, plunging 70,000 Palestinian households into darkness. Despite the rocket fire, Israel repaired the transmission lines, restoring electricity to Gaza. I do not relate these experiences to argue for an Israeli moral perfection that does not exist, or to suggest that the IDF should be immune from criticism even if it commits genuine abuses. The tragic reality is that no matter how much the IDF tries to avoid collateral damage, its operations will kill some number of civilians. That won’t be close to the carnage of noncombatants in the Syrian civil war, but it won’t matter. As one Israeli commander told me, “The world judges Israel differently,” regardless of its efforts to minimize civilian casualties. I suspect that he may be right. If so, it is essential for the IDF to be as vigilant in shaping the information environment as it is in intercepting rockets from Gaza. @James — Thanks for the full text of the Conway essay. Security sources reveal that Hamas had planned to dispatch 200 terrorists from each tunnel simultaneously, via dozens of tunnels, to six villages in the western Negev, in order to murder and kidnap dozens of Israelis. 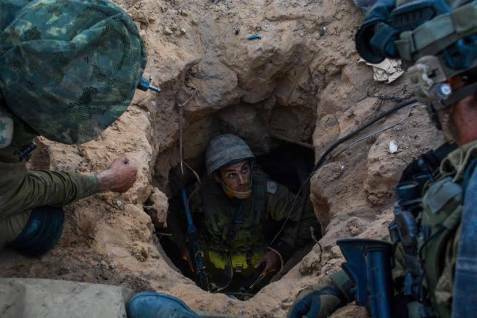 The [IDF] military campaign in Gaza led to the exposure of the network of tunnels which were dug under Gaza and led to Israel, preventing a big disaster. The horror plan of Hamas: Security sources informed NRG [the Ma’ariv online site] that the goal of the tunnels which were dug by Hamas in Gaza was to carry out a coordinated massacre against citizens of Israel this coming Rosh Hashana [25/september/2014]. The plan, which was prevented thanks to the ground operation, was to dispatch 200 terrorists from each tunnel simultaneously. In a good number of cases, their exit points were likely to be in the very heart of the villages. During the military operation, the forces in the Gaza Strip discovered that it wasn’t a matter of only tunnels running in a straight line from one point to another – but rather a complete, well-planned network of tunnels branching out from and merging with one another. Within the tunnels were rooms prepared for storing explosives, shafts for quickly breaking out from under the ground to the surface, and other features. IDF forces working in the Gaza Strip have blown up dozens of tunnels so far, but it appears that they have dozens more left to deal with. It also appears that at the moment, the soldiers are dealing with only the end-points of the tunnels in the areas that are under their control. Security sources emphasized that the political echelon is interested in eliminating the problem of the tunnels. The IDF says it requires more time, because “at the moment we are not even halfway finished.” In their words, the unplanned war with Hamas prevented a disaster on the order of the Yom Kippur War, which would have “brought the State of Israel to its knees.” They emphasized that the destruction of the tunnels already knocks out of the hands of Hamas a strategic asset which it labored to build over many years. The IDF is sending a clear message to the political echelon, one week after the army began the ground operation in the Gaza Strip: We need more time. The Southern Command has recommended in recent days to the senior military echelon to evaluate the situation, and also to the political echelon to not accept a proposal for a humanitarian ceasefire. According to the intelligence assessment, this kind of ceasefire will serve Hamas and not Israel, and it is necessary to push things to the limit, so that the heads of the military wing of the terror organization will ask themselves if it’s worthwhile for them to continue with the widespread confrontation which has been brought on them. The terror organization planned an organized battle, and after failing in a few attempts at a terror attack, and understanding that the rockets did not stand up to the “Iron Dome”, it began to prepare for a ground battle, understanding that from its own standpoint it had nothing to lose – but its people didn’t believe that it [the ground operation] would come at such an early stage, and they hoped that they would have more comfortable exit points. The downward trend of of rocket launchings in recent days was explained by the IDF as a gathering of strength for the continuation of the battle, which from the standpoint of Hamas can continue for a full month. In the field, around one third were damaged of the stockpile of 9000 rockets which the terror organization had at the beginning of the operation, and besides these around 2000 rockets have been fired at Israel. The IDF is explaining that Hamas, which started the battle, has tried to reach a mostly civilian target, and an outcome that will improve its economic viability in the Gaza areas. The main strength of the organization is underground. A strike deep in Israel, by which it would kidnap a soldier or attack a town, was the top priority of the organization, according to an orderly operational plan, which called for digging several dozen tunnels; and it is not sure that all of them are in the hands of Israel. The strategic asset of Hamas required great resources, in the scope of hundreds of millions of dollars over recent years. In the last year the process was accelerated by a special force that was established under the name “Nokba” (“the Chosen”), which began to act in the field, digging in the direction of Israel. In a counter-initiative of the Southern Command, the expanded activities were identified. Three shifts of Hamas terrorists worked on each tunnel of this kind, and during an average day they dug around 15 meters. Some of the tunnels were found in the beginning stage of work, and others were already built for a length of several hundred meters. Some even reached past the border fence, a digging of one and a half kilometers at least. Military intelligence knew about most of the tunnels, and armed forces were sent directly to them. Some were exposed by interrogation of the dozens of prisoners, which showed how wide the underground network was. With this, Israel is expecting that Hamas, which had built a capability for Judgement Day [sic – doomsday? ], has exposed all its strategic capabilities, and that it will not surprise anyone with things unforeseen. Thousands of rockets still remain in its possession, and also several unmanned aircraft. An evaluation of the situation reveals frustration among Hamas, which didn’t fully use what it had, and which was surprised by a maneuver [by IDF] that it wasn’t prepared for, and also [frustration] over the shortage of manpower on its first line of defence. This was after expecting that the maneuver that would be carried out [by the IDF] would reach deep into Gaza. The IDF, which had defined for itself in the first stage [the mission] to strike at the tunnel infrastructure, describes a situation in which it needs a few more days to fully take care of the tunnels. In parallel to the widened activities against the tunnels is the expectation of a continued battle possible in the areas of Gaza. If necessary, there are already plans for widening the action. Thanks. I actually read that this morning in a broadcast email sent out by Hannah at Restorers of Zion. Happy to learn that you’re on her list. That is whence I extracted it. Actually, back in the day, my wife was the one who had the closer relationship with Hannah. About all I hear from her (Hannah) anymore is the “Restorers” email. Hope she’s doing well. @PL: As far as the couple in my Sunday school class, I think the guy is the more “sparky” of the two. He’s spoken to me in the past about how he doesn’t by into the whole “supersessionism” argument and admits to confusion regarding the parts of the Bible that say Ezekiel’s Temple will be built when it’s generally been his belief that Jesus is now our “Temple”. He seems very classically Evangelical in his theology so we can probably extrapolate what he believes about the modern state of Israel vs what he thinks Israel will be someday when Jesus comes back. @Bruce: Boaz’s “Tent of David” book was part of the motivation for me returning to church. There’s a long story attached to that, but basically, I had a “feeling” that I needed to be in some sort of community. I didn’t want to have to go “church shopping,” but one of my sons met with a Pastor who had lived in Israel for fifteen years and he seemed unique enough to attract me to his church. I had other motivations, including my Mom and there was this Hebrew Roots blogger who goes to a church who challenged me (I don’t think he really meant to) to face up to church. It’s been a sometimes very rough road, but after thinking I’d found my niche and then losing it, I think I’m regaining some balance and purpose in church. The fact that people keep pulling me aside and asking me questions about scripture seems to be an indication that I’m considered a resource on some level. That’s really all I want…to be able to open doors for other Christians they might not otherwise have access to or even know exist.